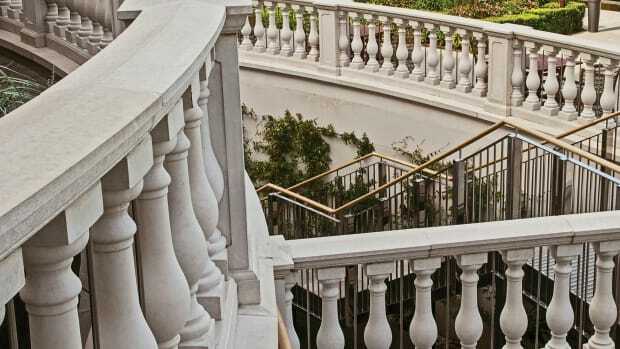 Typically, natural stone is the building block of traditional projects, whether they are restorations of historic structures or newly constructed revivals of period styles. Getting the right stone for the right project and fitting it properly is exacting and complicated work that requires full cooperation and communication among all the members of the project team. Traditional Building queried stone cutters and quarry owners to get ideas on how to make the process as smooth as polished marble. 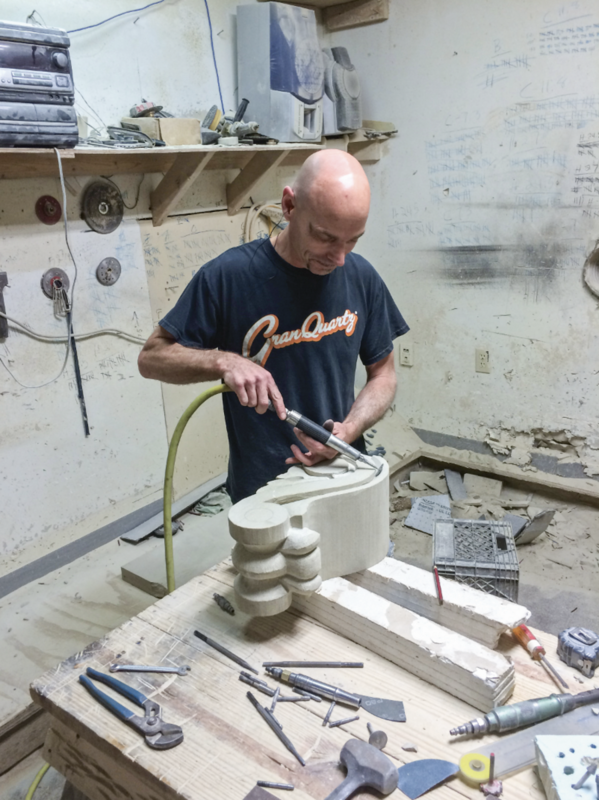 A carver at Cleveland Quarries creates foliage on a corbel. Fabricators and quarries don’t expect architects to have an encyclopedic knowledge of stones. “I appreciate it when an architect admits he doesn’t know something,” Kopelov says. In fact, the stone cutters take pride in educating the other partners on the team. Old World Stone, which is based in Canada, sends posters of common terminology to schools and universities and hands them out at trade shows, and Endless Mountain Stone Co. sends spec sheets to architects so they know what’s available before they start writing proposals. 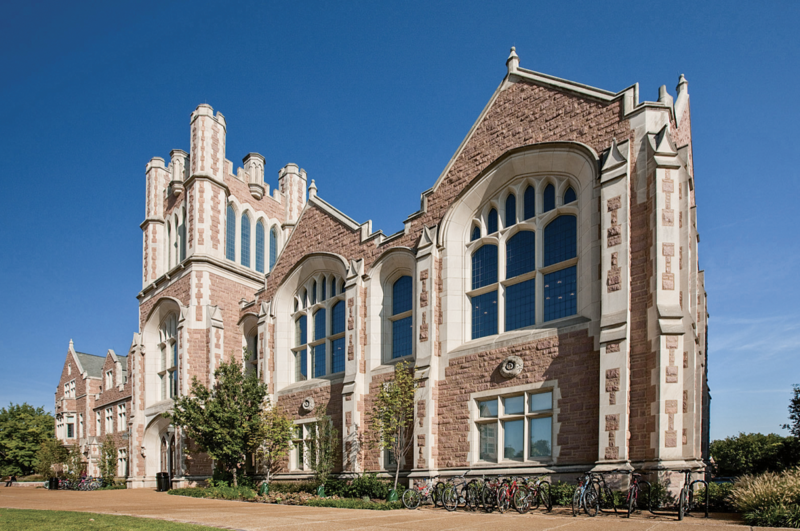 At Washington University, Bybee Stone provided limestone for several projects, including the Law School shown here. But it doesn’t have to be so steep, Coleman insists, when organizations are going out of their way to pro- mote educational programs about stone. 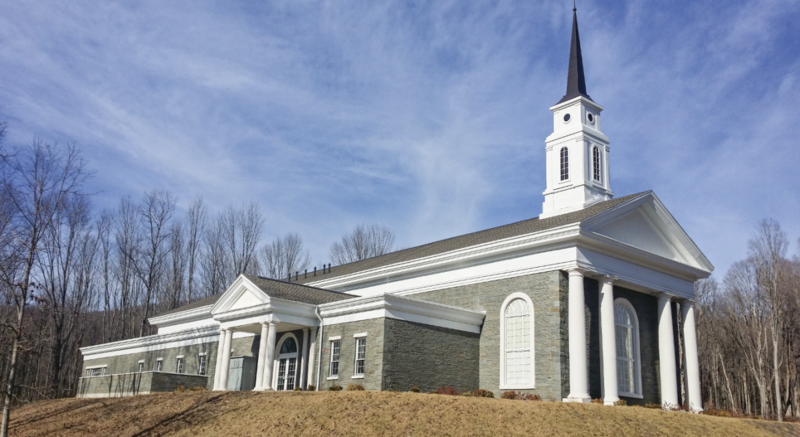 He recalls that a couple of years ago, the Building Stone Institute, a trade association for the natural-stone industry, created a one- day seminar on bluestone and invited many architects. Endless Mountain Stone supplied the stone for the Latter Day Saints Church in Susquehanna, PA.
Kopelov says that in the past this was never a problem because old-school architects were well versed in the vernacular of veins.“I’ve studied history and there was a time when they knew how to lay out templates for complicated profiles and embellishments,” he says. 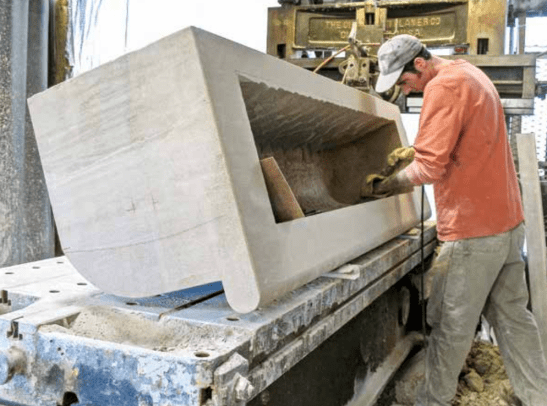 But many new architects have no experience working with natural stone.“They don’t understand its capabilities and limitations,” says Will Bybee, president and CEO of Bybee Stone Co. in Ellettsville, IN. Because natural stone is not perfect, measurements have to be precise. “To produce the best product, we need to know what the allowance is—is there some variance on one side or the other,” says Mary Neely, marketing director of Phenix Marble Co. in Springfield, MO. And, Bybee says, architects don’t realize that stone is not a one-size-fits-all product. 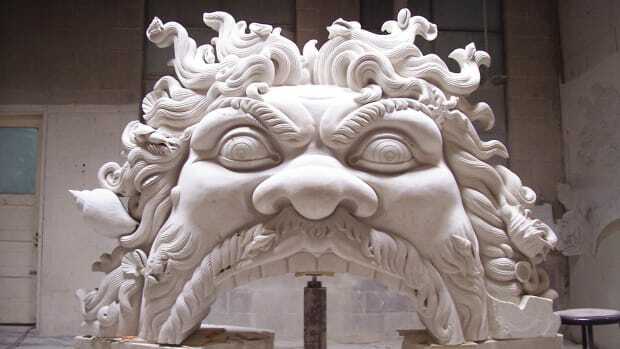 Fabricators need to have models, photographs, line drawings, computer- scanned images or even parts removed from the building to replicate intricate carvings from bygone days. “Tool finishes are often eroded on historic build- ings,” Wells says.“So you have to look for details in parts of the corners and under soffits to find the tool patterns to match the existing ones.” Also, not all architects are aware, says Dave Dunn, director of sales for Cleveland Quarries in Vermilion, OH, that ornate stone fabrication can be the most costly part of the restoration.“We often hear,‘How can it be so expensive? It’s just stone,’” he says. When stone cutters and quarries do get project specs, more often than not, crucial details are missing. The generic request to “match existing stone” has baffled more than one stone supplier. The problem with this description is that the architect doesn’t know and/or doesn’t say what the existing stone is. “Unless they have archived information, they have to guess,” Bybee says, adding that so does the quarry. Given enough clues, though, a stone fabricator or quarry can find the answer fairly quickly.“We need to see a photo or a have a piece of the stone to identify it,” saysWells.“Even a chip off the building makes a world of difference to us. Even without these, if I know the address of the building, I can usually identify the geo- graphic location of the quarry because stone is heavy and usually doesn’t travel far.” Success depends not only on finding the right stone but also the most appropriate fabricator for the particular project.“Everything is being done on a short time- frame because money is tight,” Kopelov says. “Because of this, small shops are expanding and diversifying, and they may be getting into new things such as installation or working with new materials like pre-cast stone that they have no experience with.” Bybee, however, says that even when you get the same kind of stone from the same quarry as the original, many architects are not aware that it will never match what’s there. 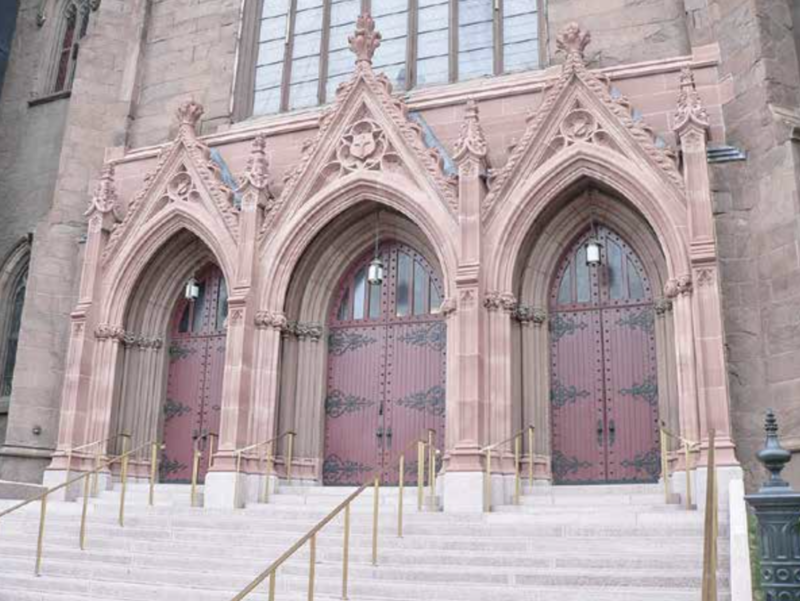 Old World Stone fabricated replacement limestone for the restoration of the entry porticos at the Cathedral of the Immaculate Conception, Albany, NY. “The first question I ask the architect is, ‘Are you going to clean the rest of the stone not being replaced? New stone will never be the same color; it takes decades to get that patina that comes from the environment the building has been living in a long time,” he says. 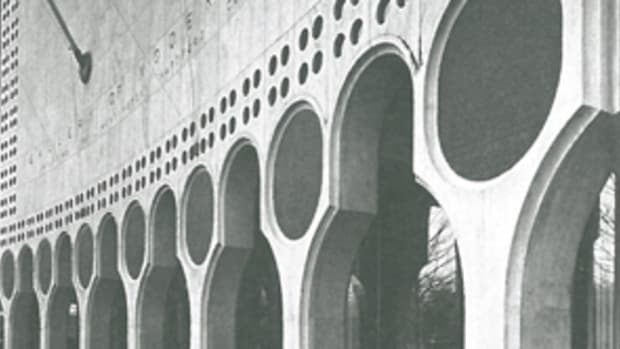 “A lot of architects want to sandblast so it all looks the same, but I don’t advise that. It’s best to let Mother Nature take its course.” Equally frustrating, says Dunn, are specs that rely upon erroneous assumptions. The architect for a small restoration project at a late-1880s county courthouse 15 miles from Cleveland Quarries, for instance, specified Indiana limestone. The problem was that it was Berea sandstone. Kopelov adds that sometimes it’s impossible for him to get the specified stone because the sole supplier has a deal to sell only to one shop, a fact that would have been revealed early in the game had the architect done due diligence. Bybee Stone Co. Ellettsville, IN : The Indiana limestone fabricator, which has been producing cut stone since 1864, was bought in 1979 by the Bybee family, now in its fifth generation. Some of its equipment, notably gang saws, is more than a century old. It has worked on restoration projects at the Pentagon, the U.S. Capitol, the Iowa State Capitol in Des Moines and virtually every Ivy League college. Cleveland Quarries Vermilion, OH: The sole supplier of Berea sandstone, Cleveland Quarries has been in operation since 1868 and has done large-scale restorations from coast to coast. One of the country’s older and more well known sandstone quarries, it has a full-scale, 170,000-sq.ft. fabrication center. Its sandstone is on the 1872 Michigan State Capitol, the late 1800s Parliament Hill in Ottowa, Canada; the 1931 Buffalo City Hall in Buffalo, NY; the 1906 Court House in Akron, OH; the 1878 Kenmore Hotel in Albany, NY, and the 1938 Library and Fine Arts Building at Albion College in Albion, MI. Endless Mountain Stone Co. Susquehanna, PA: Established in 1976, this third-generation, family-owned quarry on 1,500 reserved acres has provided one of the more diversified selections of bluestone in the industry. The inventor of tumbled bluestone, it offers everything from building stone to polished countertops. It provided sidewalk pavers for Independence Hall in Philadelphia and for Princeton University’s Gothic Revival Whitman College. Kopelov Cut Stone Bedford, IN: This custom-stone and carving mill, operated by father and son Labe and Kino Kopelov, relocated from New Mexico in 2016. It produces work that combines the efficiency of machines with the aesthetics of hand work. The company’s projects include the Chronicle Building in San Francisco, the Saint Francis Cathedral in Santa Fe, NM, and the Spreckles Temple of Music in San Francisco. Old World Stone Ltd. Burlington, Ontario, Canada: This custom fabricator of dimensional-cut limestone, sandstone and marble buys stone from domestic and other quarries around the world. The state-of-the-art fabrication plant, which is on a 7-acre industrial site, covers 62,000 square feet. The 30-year-old company specializes in historic restoration work, having supplied replacement limestone for the Chapel at Princeton University, the sandstone entry porticos at the Cathedral of the Immaculate Conception in Albany, NY, and sandstone tracery windows at the Packer Memorial Church at Lehigh University in Bethlehem, PA.
Phenix Marble Co. Springfield, MO: The recently reopened quarry is more than a century old. It is renowned for its Napoleon Gray marble, which lines the walls of the New York Stock Exchange, the grand entrance of the Palace of the Legion of Honor in San Francisco and banks, train stations, grand hotels, museums and many other public buildings around the country. Napoleon Gray, a vein-cut marble, is distinct: It looks like a seismographic reading.